This week Newton's Nook Designs and Therm O Web are partnering for a fabulous inspiration week! All week long both design teams will be sharing ways to add fun foils and more to your cards using Therm O Web products with Newton's Nook Designs stamps! There are prizes too! Read all the way to the end of this post to find out how you can win! Today we are featuring projects by Larissa and Amanda! Larissa created an adorable scene of the caroling kitties in front of a window. She colored those cute kitties from our Caroling Newton Stamp Set using fun bright holiday colors. Then she cut the trio of kitties out using the coordinating Caroling Newton Die Set. She also adding in those two sweet caroling mice from the Caroling Newton Stamp Set. For her scene she created a lovely window backdrop using Designer Toner Sheets (Starry Night and Rustic Winter) from Therm O Web for the window scene. For the trees on each side of the window she cut out the tall skinny trees using our new Forest Scene Builder Die Set and added foil to the die cut images using Deco Foil Toner Sheets and Gina K Designs Fancy Foil in Gold Sequins and Emerald Watercolor from Therm O Web. On the inside of the card she used our Music Stencil and the Sentiment "Wishing you the Happiest of Holidays" from our new Ornamental Wishes Stamp Set to finish off the design!! Visit Larissa's blog: Larissa Heskett Designs to see more and leave a comment for another chance to win! Amanda created this beautiful shaker card featuring those cute kitties and pumpkins from our Autumn Newton Stamp Set! She colored the image with copics and cut it out using the coordinating Autumn Newton Die Set. Then she created a beautiful shaker window panel using using Designer Toner Sheets (Wheat Fields) with Opal Deco Foil from Therm O Web to create the sparkly wheat pattern. She used this for the front of the shaker and framed it with a die cut frame that was cut out using our Frames & Flags Die Set. She also added the "be thankful" sentiment from our Autumn Newton Stamp Set, embossed in white on a banner that was cut out using our Frames & Flags Die Set. So adorable and perfect for Fall! Visit Amanda's blog: Rutabaga Pie Designs to see more and leave a comment for another chance to win! There are also more amazing projects today over on the Therm O Web blog so pop over there for more inspiration! Would you like to win a Prize pack including a $25 store credit to Therm O Web AND a $25 store credit to Newton’s Nook Designs? Here's how to win: Leave comments on the NND & Design Team blog posts using therm-o-web products all week (November 5-9) to enter. One winner will be randomly chosen from blog posts throughout the week so the more posts you leave comments on the better your chances are of winning! You have until Friday November 9th at midnight CST to comment. The winner will be announced on the NND blog post on Monday, November 12th. Want another chance to win? Therm O Web will also be giving away a prize pack! Visit the Therm O Web blog each day this week for more inspiration and leave comments there for another chance to win! Both of these are BEAUTIFUL! I love the shakers in such a unique way! Fabulous cards by Larissa and Amanda! Love the caroling kitties and mice on Larissa's card! Awesome scene and details! So pretty with the foiled trees and window decorations! And Amanda's shaker card is so pretty for fall! Love the kitties and pumpkins! Both of these are fabulous projects. Love them. thanks for sharing and for the chance to win..
you have inspired me to try the foiling. Fabulous cards, they are both just awesome! Wonderful cards. Would love.to see how.the thermo Web is applied. The background for the carolers is WONDERFUL!!!!!!!!!!!!! Wonderful caroling scene and beautiful Fall shaker. OMG, both cards are simply stunning!! Beautiful ideas for cards! 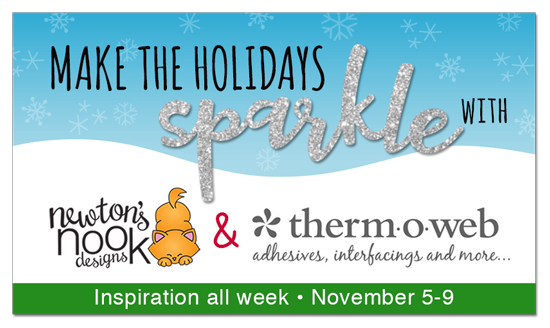 Love Newton’s Nook & Thermoweb! Wow! Both cards are fabulous. Foiling adds a beautifully festive touch. Newton never looked better. OMG! Totally in love with both projects! Simply wonderful! Thank you for the inspiration! Fantastic cards! I love Larissa's caroling Newton! Those caroling kitties are my favorite! 2018 Fall/Winter Coffee Lovers Blog Hop! Black Friday Sale + Blog Hop Winners! Happy Thanksgiving & Black Friday Sale Preview!